The International Education Week (IEW) is a joint initiative of the US Department of State and the US Department of Education that aims to celebrate the benefits of international education and exchange worldwide. It is a yearly event scheduled between November 13-17. 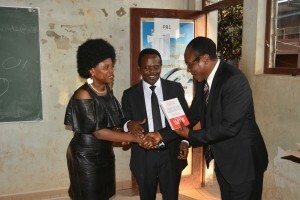 In view of the number of Fulbright Alumni in the Department of English at the Ecole Normale Supérieure (ENS): Prof. Daniel A. Nkemleke (senior Fulbright Scholar, University of Massachusetts, 2010-2011), Dr Yvonne Ngwa Iden (Studies of United States Institute for Contemporary American Literature, University of Louis Ville, Kentucky (2015), and Mr Patrick Roderique Belibi Enama (junior Fulbright scholar, State University of New York (2012-2014), an academic forum was organized at ENS on November 14, 1-4 p.m. to highlight the implication of education inherent in this year’s general theme for the event: “Promoting Educational and Cultural Exchanges”. A keynote discourse on competency-based approach to English language teaching was presented by Mr Patrick Roderique Belibi Enama—a befitting subject for student teachers in one of the country’s famous institution for teacher training (ENS). The presentation was very instructive, but also highly academic. General discussion following the presentation enriched understanding of both students and staff present on the genesis and evolution of the competency-based approach. The approach is a major orientation of government’s pedagogic policy for English language teaching in Cameroonian schools today. 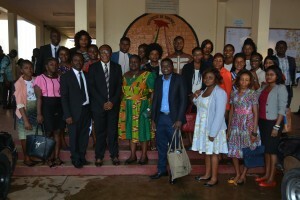 In attendance were over 60 students of the Department, Mr Gerald Chilla, representative of the Cultural Affairs Officer at the US Embassy in Yaoundé, Professor Daniel Nkemleke, Chair of the Department, Dr Divine Che Neba, senior lecturer in the Department, Dr Eleanor Dasi, senior lecturer in the Department, Dr David Kusi, senior lecturer in the department, and Mr Julius Kum, assistant lecturer in the department. 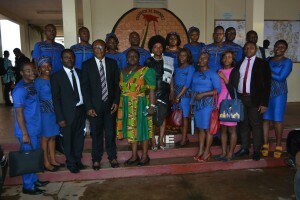 Professor Daniel Nkemleke, who chaired the forum, acknowledged the significant contribution to education, training and scholarship that the Cultural Affairs Section of the US Embassy in Yaoundé had made to the professional development of staff of the department so far. On behalf of the Department and the Director of ENS, he appreciated the fruitful co-operation between the US Embassy and ENS. The academic forum ended with an overview of the US Government educational and scholarship opportunities for students by Mr Gerald Chilla, who denotated thirty-five copies of eleven different books in French to the department for the benefit of students. The books cover a wide range of subject including culture, society, politics, management, diseases etc. you can download the PDF version here IEW Report.